I am writing this as a result of some guys who asked me to, and i noticed that it will be of great benefit to many, as well. Most of us,i believe have alot of custom rom's zip files we kept somewhere so that we can always flash them whenever we want.Many times some custom rom comes with an some very useful apps like beats.apk and dsp manager.apk which alot of us will like to have on your stock rom or other custom rom who dont have it.Now am going to show you how to install them on your device. * 1 minute of you time. * Firstly,you have to identify which rom has the application you need. * In ex exlorer navigate to where the zip file of the rom is kept. * You should see a list of all application contained in that rom's zip file. 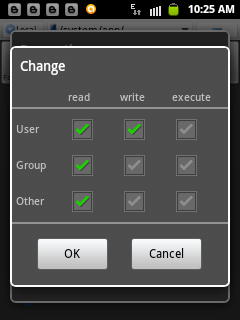 * Look at the upper bar of ex xplorer and click on the select button,it should bring a pop up like multi select ready. * Now tap only the application you need,(notice that all apps you selected will be highlighted in green color. * Now just beside the select button you press earlier at the upper bar on ex explore there is a button "extract" tap on it and a pop up will appear,just press ok and the selected apps get extracted. * Go back to the folder where the rom's zip file was located,there will be a folder created named as the name of the rom you extracted from.you should see the apps you extracted now. * Close es xplorer and reopen it,Now you should see those app in the system/app of device. * Finally set permission for each of the apps you pasted like the picture below. * It will be more save to make a backup of you present rom before doing this. * Follow instruction properly and bo problem will arise. Why i can't flash any ROM? Does it only deodex device for doing custom rom, Doesn't? No need to follow such a cumbersome procedure. Simply extract the required app from the apps folder using 7-zip and transfer that file to mobile. Install it. Its as simple as that. Follow our signals NOW & make up to 270% daily.